Our apartments. Welcome to Kristall Apartments, Winterberg-Neuastenberg, Germany Kristall Apartments, luxury apartments in Winterberg-Neuastenberg, Germany is a brilliant place to spend your vacation. Whether you like the slopes and après ski, or a quiet getaway with your family, a truly memorable mountain vacation starts here at the Kristall Apartments. But Neuastenberg offers more then skiing. The mountains are perfect for any time of the year offering hiking, biking, fishing, golfing, and more. The breathtaking mountain views in combination with the elegant and stylish, yet comfortable apartments, makes your lodging far beyond ordinary. Make a reservation or contact Kristall Apartments and start planning your vacation today! In the Sauerland are numerous golf courses and golf clubs where lovers of golf can enjoy themselves. Most courses are idyllically situated in the beautiful hilly landscape. Just 18 kilometers away (max. 30 km) you will also find two 18-hole golf courses. The many hills of the Sauerland with vast forests and fields are ideal for wonderful walking. On this hike you most of the time follow the well-marked hiking trails of Rothaarsteig and Uplandsteig hikes. Enjoy each walking day! Cycle through the rolling countryside of the Sauerland. Over the hills, mountains and the beautiful valleys you will pass several lakes where you can take a picnic. The well-marked routes take you on an amazing bike adventure. Sauerland is also an excellent mountain bike destination. 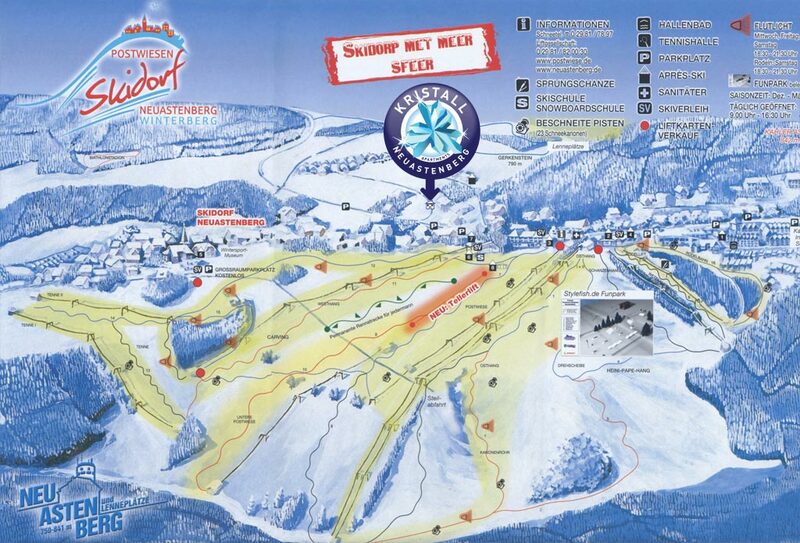 Besides the famous Winterberg are plentiful alternative ski areas in the near periphery. One is in Neuastenberg Postwiesen-ski. Located on one of the terraces on the edge of the village is the largest part of this area to oversee, a large slope with slopes for all abilities and a toboggan run with private elevator.